Reading Portland – Welcome to the 2019 Beemie Awards! So last year, before I started writing Southbound, I started a personal journey of sorts. 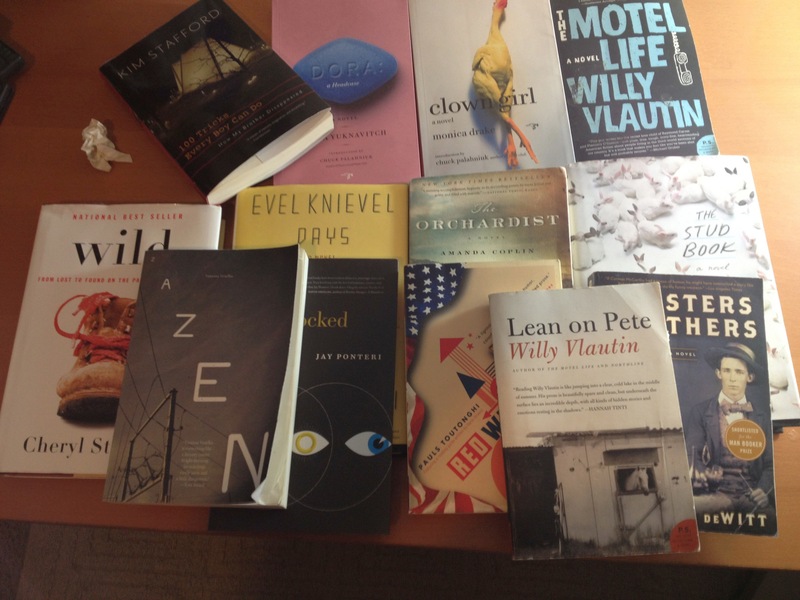 I had read some books by my friend Willy Vlautin (Lean On Pete, Motel Life) and loved them. When I asked him if he knew of any writing teachers or groups in town, he gave me a couple of people to contact. He also recommended just a couple of local writers to read. I remember him saying “Read Monica Drake, she’s hilarious. At least, she cracks me up.” So I bought Clown Girl. It was quirky and a little strange, but as he said, it made me laugh out loud. A lot. When reading Clown Girl I noticed that not only was Monica a local writer, but her press, Hawthorne Books was as well. Huh. Who knew? So after finishing Clown Girl I thought i’d check out another Hawthorne Book, since it was newly out, I bought Dora: A Headcase. I read Dora in a day. Honestly the first time I think i’d ever done that. Usually I’m more of an hour or two reader a day, but it was that fun. Lidia Yuknavitch instantly had me hooked, and apparently she had another book. The Chronology of Water was her memoir, and I read that in….less than a day. I became a disciple of the kingdom of Lidia immediately. Her books make me feel. Which is really what I want most from a book. So before writing Southbound I started reading all sorts of Portland authors….people like Vanessa Veselka (Zazen), Pauls Toutonghi (Evil Knievel Days, Red Weather), Kim Stafford(100 Tricks Every Boy Should Know), Patrick DeWitt (Ablutions, Sisters Brothers) and others. Once I started writing the novel, I honestly didn’t read anything for three months. But after that first draft was done, I’d go through and edit for a while, then take a week off and get away from the manuscript. During these breaks I read Chloe Caldwell (Legs Get Led Astray), Amanda Coplin (The Orchardist), Monica Drake again (The Stud Book), Jay Ponteri (Wedlocked) and Cheryl Strayed (Wild). What I found by reading these books, stories that were penned here, was how amazing the creativity was in this city. These people are my neighbors and teachers. They shop at the same Zupans I do (Hi Chuck Palahniuk!) The other cool part was they all did readings around here. I took every opportunity I could to meet and talk with them about the stories and writing in general. The other day I read “Ham on Rye” by Charles Bukowski and felt like I was cheating by reading someone from outside of Portland. But I’ll get local again soon. Chronology of Water and Dora from Lidia Yuknavitch: She’s my favorite. I’m biased. Each sentence feels like an experience. Legs Get Led Astray from Chloe Caldwell: I’ve recommended this to a few friends. I tell them “It’s like the TV show Girls, only it’s real, and I like the writing better.” There’s times you fall in love with Chloe, and times you want her to shake her to get back to her senses. But it’s real and raw. Clown Girl from Monica Drake: I can see how maybe this book doesn’t hit some people’s sense of humor button, but it cracked me up too often. One of the more fun experience’s I’ve had with a book. Wild from Cheryl Strayed: I know everyone’s read this, but it really was pretty damn good. This entry was tagged evil knievel days, kim stafford, monica drake, red weather, vanessa veselka. Bookmark the permalink.